We now have a years worth of solar data for City Hall, so I thought is was a good time to recalculate the solar power percentages for the three sites. 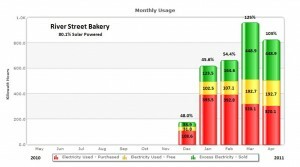 I took the graphs from the “Monthly Usage Chart” for the three sites and added the values you get when you hover your mouse over the different parts of the bar charts. Red is the power we “buy” from the utility company. Yellow is the solar generated power that we used as it was being generated. Green is solar power that we generated but could not use when it was generated, so it was exported back to the utility grid and powered our neighbor’s toaster. We get full credit for that power and it off-sets the power that we “buy” back in the evening. 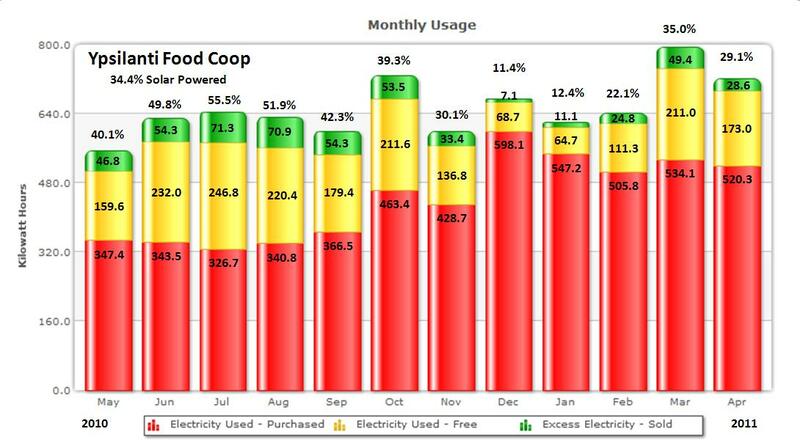 To calculate the percent solar power for a given month, we divide the total solar power generated (yellow + green) by the total power consumed (red + yellow). 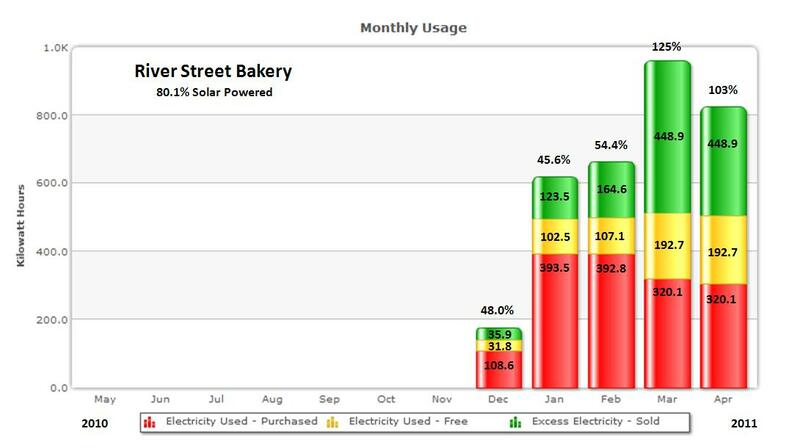 If yellow plus green is BIGGER than red plus yellow, then we generated more power then we needed for that month and, as in the case for the bakery, are 100% solar powered for the months of March and April and 80.1% solar powered for the year so far. 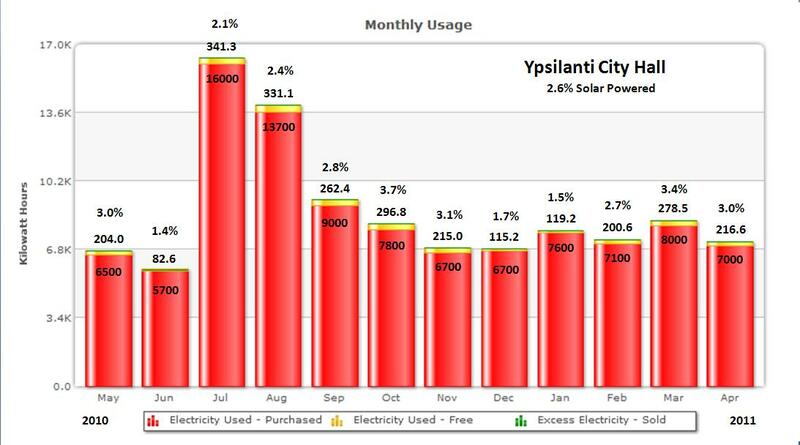 Ypsilanti’s City Hall was 2.6% solar powered and the bulk food section of the Ypsilanti Food Cooperative was 34.4% solar powered. Hopefully we can upgrade some of the lights and/or appliances in City Hall and raise it’s percent solar by using less power. I also looked at the efficiency of the three installations. City Hall has twelve 205 watt solar panels for a total wattage of 2.46 KW. Assuming 4 hours of peak sun per day and 365 days per year, that installation should generate 3,592 KWH per year. Adding all the yellow bars on that graph (there is no green) I get 2663 KWH, or 74.1% efficient. The Ypsi Food Coop has twelve 190 watt panels for a total wattage of 2.28 KW. Making the same assumptions, it should generate 3329 KWH per year. 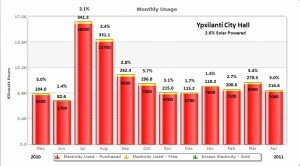 Adding all the yellow and green on that chart I get 2753 KWH, or 82.7% efficient. I believe the reason the Ypsi Food Coop is more efficient is because it sits on a white roof and gets more reflected sun light and also the heat from the building in the winter time makes the snow slide off sooner. The Bakery is harder to calculate because I don’t have a full years worth of data. It has thirty 200 watt panels for a total of 6.0 KW. 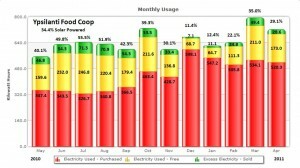 If I just use the first four months of 2011, the efficiency is 58% which is quite low. There is a tree that needs some trimming and we need to get some data from the summer months to be more accurate. I’ll recalculate this fall and keep you posted.